Join us on Saturday, November 10, 2018 for an incredible day of fishing on the Rappahannock River. The tournament is based out of Garrett’s Marina in Bowlers Wharf, Virginia. Awesome prize money for the heaviest fish! New for 2018! Tournament T-shirt designed by ACDS student Samual Sturt, CLICK HERE to purchase yours before they are sold out! 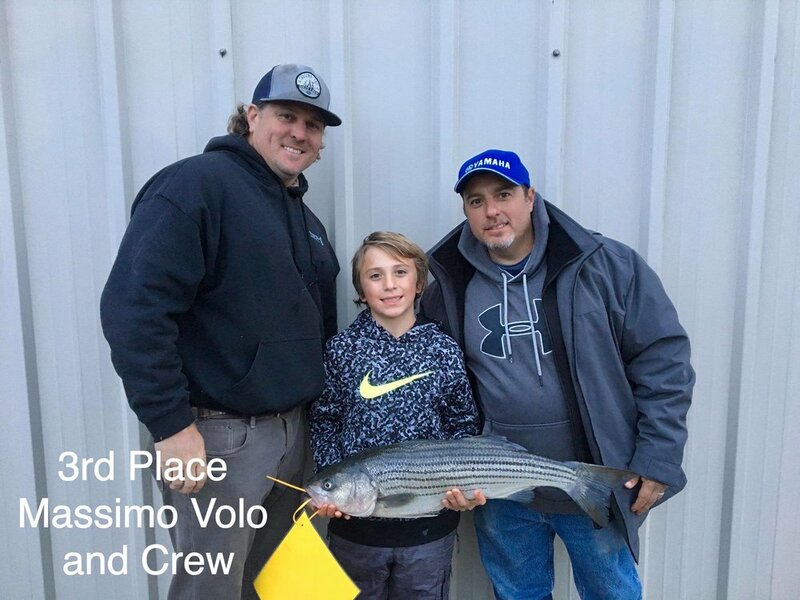 Thank you for participating in the 2018 Rappahannock River Rockfish Open. This fundraiser, sponsored by the Aylett Country Day School Board of Directors, benefits students by helping to keep tuition costs at an affordable rate, as we continue our “traditions of excellence in education”. On behalf of the students, parents, faculty and the ACDS Board of Directors, thank you again. Learn more about Aylett Country Day School, here. Winning fish will be determined first by weight, then by length (nose to tip of tail) and then by weigh-in time, in that order. 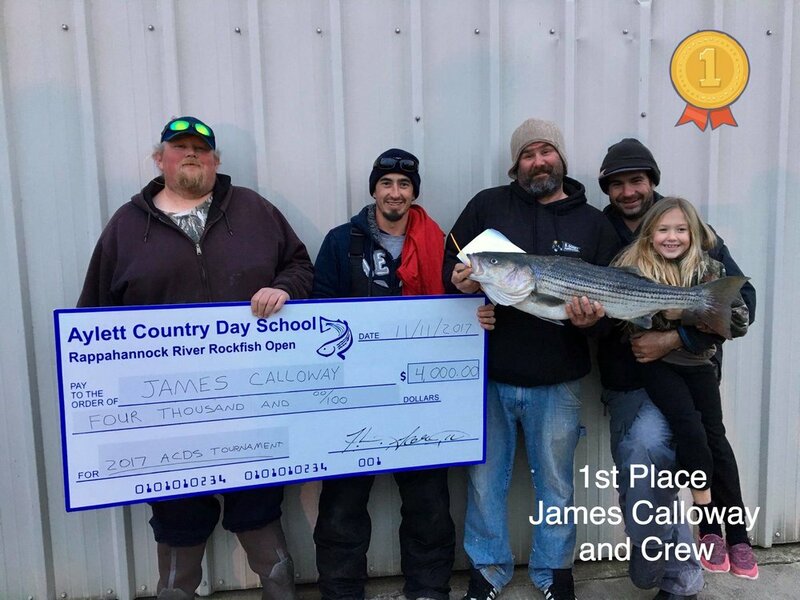 The ninth annual Aylett Country Day School Rappahannock River Rockfish Open will take place on November 10, 2018 from 7:00 a.m. - 4:30 p.m. The tournament registration fee is $225. Entry fees are a charitable donation and are NON-REFUNDABLE. The entry fee includes a captain’s t-shirt (additional t-shirts may be purchased for $20) and two passes to the Weigh-In Reception. You may register online through this site or download and mail in your registration form. Registration closes at 9:00 a.m. on November 10, 2018. The tournament will being at 7:00 a.m. on November 10, 2018. Fishing is allowed between the bridges of Tappahannock and White Stone. Only Rockfish will qualify for prizes. All fish must be transported by boat to Garrett’s Marina and available for weighing by 4:30 p.m. the day of the tournament. No exceptions. Winning fish will be determined first by weight, then by length (nose to tip of tail) and then by weigh-in time, in that order. All are welcome to join us for the Weigh-In Reception. There will be a BBQ dinner served and cold beverages. The reception is held at Garrett’s Marina. Two passes are included with paid registration. Additional passes are $10 each and may be purchased through this site. Thank you to our generous sponsors for making this tournament possible. We appreciate all you do for Aylett Country Day School.